INGREDIENTS: Grape Peanut Crunch Orchard Bar fruit [fruit juice from concentrate (organic apple, concord grape), red grapes, organic apple flake], organic evaporated cane syrup, organic tapioca syrup, peanuts seeds (sunflower, flax), soy protein nuggets (soy protein isolate, tapioca starch, salt), fruit pectin, citric acid, natural flavors, sodium citrate, ascorbic acid, Vitamin E (to preserve freshness). ALLERGEN INFORMATION: Contains peanuts and soy. May contain traces of other tree nuts not listed in the ingredients. Peanut butter and jelly 2.0! 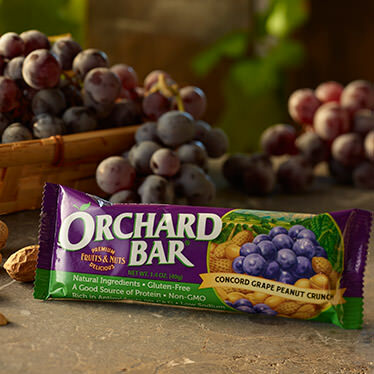 This bar is my absolute favorite because it is the perfect balance of sweet grapes and salty peanuts! Whenever I am craving a peanut butter and jelly sandwich, I grab one of these and I'm instantly satisfied! Thank you Liberty Orchard! !